Last year tributes had Subway commercials to shake our heads at and this year it looks like we may get to do it for Doritos. Thanks to a tip from one of our followers on Twitter, we now know that Lionsgate and Doritos are partnering to present tributes with a mission to “unlock District 13” at UnlockDistrict13.com. 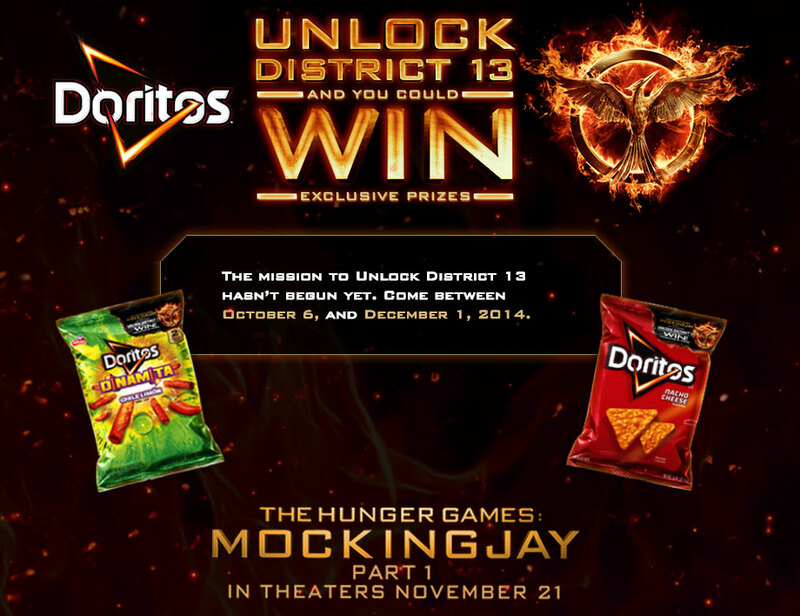 While it is unclear what the mission will provide in the way of prizes, it appears to involve scanning bar codes from Doritos bags to enter to win prizes. The mission will begin on Monday, October 6, 2014. What do you think about this promotion? Does it make you shake your head? Does it not matter because The Hunger Games is just fiction? Tell us your thoughts! Update: One of our readers has pointed out the prizes list and they actually seem pretty cool, specifically tailored to each of the 13 Districts of Panem. First Prizes (2): One (1) gold bar (1.5 ounces). ARV: $1,824.30 each. $1,216.20 per oz. gold value as of September 19, 2014. Gold value fluctuates. Second Prizes (10): One (1) district-specific t-shirt. ARV: $20 each. 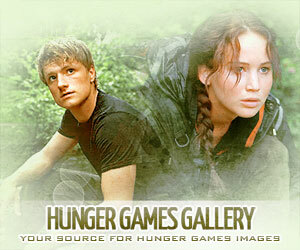 Third Prizes (4): One (1) “The Hunger Games: Mockingjay – Part 1” (the “Movie”) tie-in book. ARV: $12 each. Fourth Prizes (1,600): One (1) Fandango Promo Code. ARV: $10 each. Fifth Prizes (100): One (1) mini-Movie poster. ARV: $.50 each. First Prizes (3): Rock climbing kit (contents to be determined by Sponsor, in Sponsor’s sole discretion). ARV: $1,000 each. First Prizes (2): Technology prize pack (contents to be determined by Sponsor, in Sponsor’s sole discretion). ARV: $1,500 each. First Prizes (3): Fishing prize pack (contents to be determined by Sponsor, in Sponsor’s sole discretion). ARV: $1,000 each. First Prizes (3): $1,000 (awarded in the form of a check, payable to winner) which may be used toward the winner’s utility bill. ARV: $1,000 each. First Prizes (2): $1,500 airline gift card. ARV: $1,500 each. Airline to be determined by Sponsor, in Sponsor’s sole discretion. First Prize (1): Seven (7) day cabin rental in Colorado. Redeem by June 1, 2015. Transportation not included. Cash option available. All details to be determined by Sponsor, in Sponsor’s sole discretion. ARV: $3,000. First Prizes (3): $1,000 (awarded in the form of a check, payable to winner) which may be used toward a shopping spree. ARV: $1,000 each. First Prizes (3): Grocery gift cards totaling $1,000. Grocery gift cards will be awarded in the form of a pre-paid debit card. ARV: $1,000 each. First Prizes (3): $1,000 Omaha Steak gift card. ARV: $1,000 each. First Prizes (2): Free DORITOS® brand Tortilla Chips for a year will be awarded in the form of one hundred four (104) coupons; each coupon redeemable for one (1) bag of DORITOS® brand Tortilla Chips valued up to $4.29 each. Winner will receive one hundred four (104) coupons. Coupons subject to terms and conditions as stated on the coupon. ARV: $446.16 each. First Prizes (3): One (1) grill set (contents to be determined by Sponsor, in Sponsor’s sole discretion). ARV: $1,000 each. Grand Prizes (5): Each Grand Prize consists of: (i) two (2) tickets (for the Grand Prize winner and one  guest) to attend the premiere screening of the Movie (the “Premiere”), currently anticipated to take place in Los Angeles, California; (ii) roundtrip coach airfare for the Grand Prize winner and one (1) guest from a major airport near the Grand Prize winner’s residence (to be determined by Sponsor in its sole discretion) to Los Angeles; (iii) hotel accommodations for two (2) nights for the Grand Prize winner and his or her travel companion at a Los Angeles area hotel as determined by Sponsor in its sole discretion (one room, double occupancy, room and tax only); (iv) ground transportation to and from the Premiere; and (v) $1,200 spending money (awarded in the form of a check, payable to the Grand Prize winner, or their parent or legal guardian if the Grand Prize winner is a minor). Any other costs associated with acceptance or use of the Grand Prize is at the Grand Prize winner’s and their guest’s sole expense, including, but not limited to, any ground transportation associated with the Grand Prize, rental car(s), parking fees, gasoline, tolls, food and beverages. All details of the Grand Prize (including but not limited to any anticipated dates and times) are subject to change at Sponsor’s sole discretion. The ARV of the Grand Prize is $4,200. The ARV represents Sponsor’s good faith determination of the actual fair market value and, as ultimately determined by Sponsor, is final and binding and cannot be challenged or appealed. In the event that a stated ARV is more than the actual fair market value, the difference will not be awarded in cash or otherwise. First Prize (1): One (1) 55-inch curve TV. Winner responsible for set up and installation. ARV: $3,000. Second Prize (1): One (1) laptop. ARV: $2,000. Third Prize (1): One (1) watch. ARV: $300. 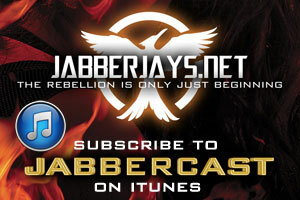 Fourth Prizes (500): “Mockingjay Pack” consisting of one (1) Mockingjay t-shirt and one (1) Mockingjay pin. ARV: $30 each Mockingjay Pack. Fifth Prizes (10): One (1) district-specific t-shirt. ARV: $20 each. Sixth Prizes (50): “District 13 Pack” consisting of one (1) District 13 bandana and one (1) Movie poster signed by talent from the Movie (to be determined in Sponsor’s sole discretion). Sponsor neither warrants nor represents that Movie posters can be sold or traded for the stated value; the actual value depends on market conditions which fluctuate. Autographs have no cash value. ARV: $6 each District 13 Pack.